Lists are great for lots of things, from organizing to-do's, to ranking all-time best movies, to writing kickass Hungarian Rhapsody's. 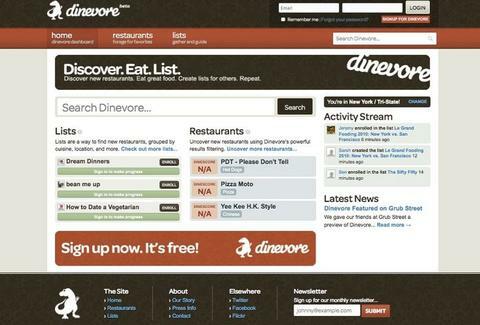 Helping you list up dinner out: Dinevore. Launched by an NYer whose friends endlessly harangued him for resto advice, Dinevore enables informed dining decisions by combining user-generated recs/tracking with meta-scored reviews from a breadth of pro critics a la Rotten Tomatoes, the actual presence of which severely impact said meta scores. Repping over 5000 local eateries, each resto can be one-clicked onto master compilations of joints you've eaten at/want to try (both avail as an interactive "map view"), or can be easily added to thematic lists; users can enroll in other members lists and easily see how much they've eaten through via a progress bar, with currently popular offerings including Sam Sifton's "Sifty's Fifty", "Best NYC Steaks", and "25 Brooklyn Favorites", which unlike Brooklyn's Finest don't serve steaming bowls of Snipe. For those more swayed by the pros, they've also created a Dinescore system that compiles and converts reviews from trusted sources (Michelin, NY Times, Zagat...) into a meta score on a 1-100 scale; users can also affect the overall score by disagreeing with a particular source to lessen its weight, a counter-productive strategy when it comes to girlfriends. Rounding it out's an online community aspect fostered by the ability to follow users with similar tastes to get a running update of their activity -- great, but it may be a lot of information to Handel.